Is frogging really the right term? Ripping out? Taking back? Whatever the term is for "I've made a mistake and now I have to undo what I've knit and redo it", I hate doing it and this is what I had to do this morning. Frogging = horrible. I had to take out about 4 rows. But it's 4 rows of about 100 stitches. Not as bad as it could be, but still it isn't ideal. I hate having to pick up stitches after ripping. I'm always worried that I'm going to drop a stitch somewhere and not notice until it's too late. The worst part of the whole thing? I wasn't ripping because I made a mistake in following the instructions. No I was being overly careful about making sure to increase in the right stitch and not miss anything (like I sometimes have the tendency to do). No instead, I had to rip because I forgot to do the two plain blue knit/purl row between the rose patterned rows. I just forgot and ruined the pattern. That's what I get for knitting while watching Pushing Daisies. Great show. I love Chuck & all her dresses. Forgive the pie maker already. He didn't mean it. See, and that's how I forgot to do those two blue rows. So, since I think that blog posts are so much more interesting with pictures, and yet there isn't much to show on the sleeves I'm working on, I thought I'd review some of the crafts from last year. 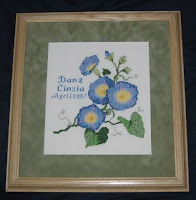 For the past about 4 years my go to gift for any of my friends getting married is a cross stitch. I've done five, and since I just heard that someone else got engaged, I might have another one of these on the horizon. They've all been different, and other than one, they've all been partially home designed. By that I mean I take a few different patterns and mix them together to get the end creation. This one was for one of my University friends. I don't know why the Morning Glories said "Dan" to me, but when I saw them it just spoke to me. Then it was a matter of taking out a few of the blooms and adding in the lettering (it took 6 attempts to get the right font) I think he and his wife like it. I got this book out of the library (love the library) last year called something like "knitting for peace". I thought to myself: "I like knitting, I like peace." Its a good book that has lots of different options for what you can knit and then organizations that you can donate your work to. This one was the one that caught my eye. 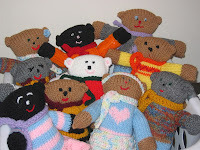 http://motherbearproject.org/ It sends the bears that you knit to orphan kids in Africa. How can you say no to that? These are the 10 bears that I knit up. I had some girl bears with skirts and one with a flower in her hair. Not that you can tell in these pictures, but I used these bears to practice techniques like simple cables and patterning. I think my favourite was a little soccer player. He had cleats and a number on the back of his jersey even. So cute. 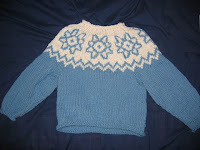 the first real sweater I ever finished and it was made for the majority on circular needles. It wasn't as hard as I'd feared. The worst part was when I gave it to him and it didn't fit over his head and I was at my parent's so I didn't have any extra yarn. I had to take apart the matching hat so I could re-knit the neckline looser. But in the end it all worked out. It was a bit big, but hopefully he'll grow into it soon. Those were the major crafts from 2007, although some aren't shown. i.e. the Ravenclaw scarf I made for a friend and then the matching one I made for myself cause I liked his so much. Also, there were a few baby blankets in there too. (Go to gift when a friend has a baby.) I now I think that's about it. And it's time for me to run. But before I go, just because I mentioned it last time, the car has been fixed. $800 later, Sue (the car) is okay and has been driving well, but I am sort of considering selling her. We'll see.